In Raja Ampat Regency, Batanta Island becomes one of the most visited vacation destinations. There is definitely a reason behind it. Apart from being one of the major islands in Raja Ampat, it is the home of a beautiful tourist spot, called Batanta Waterfall. Even though it takes a little bit effort to reach the location, the atmosphere is quite rewarding. Providing refreshing air and cool water, the waterfall has become a good location to take a bath and to relax. Due to its beauty, it also becomes a great object for photography! 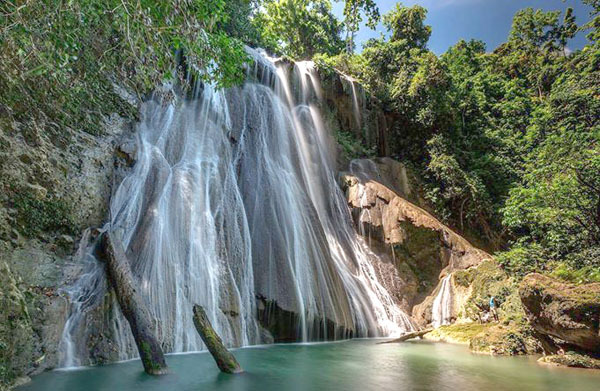 Despite the tropical climate, Batanta Waterfall provides cool and refreshing water. No wonder, visitors would get in the water once they reach the location. Some people even say the water is good for health. The height is about 10 meters, so it appears quite majestic! The water comes down beautifully, which are similar to a bulk of silk. Near to the waterfall, some trees grow abundantly. Not to mention river rocks lie there. People often climb the rocks and take some selfies on it. Batanta Waterfall is located near to Arefi Village. The thing is visitors should spend a little bit trekking to reach the location. It doesn’t become an issue, though. People can consider it an adventure and exercise. At the end of the trekking, they will be rewarded with a pristine waterfall with its calming nuance. Nothing can beat such superiority! Apart from the calming nuance, the waterfall also offers other uniqueness. For example, it is the small cave located behind the falls. The size is small, though. It can only accommodate 5 people. Swimming becomes a common activity in Batanta Waterfall. It is because the water is clear and fresh, even kids would love it. The thing is the waterfall doesn’t have strong flows of water, as the area has a low rainfall. Despite this fact, no one gets disappointed with the quality of the water. After go swimming, tourists can rest inside the small cave and witness nature scenery from the location. Overall, visitors are likely to get wet, so they should have prepared extra clothes prior to reaching the waterfall. As for the tip, make sure to come with a good stamina and proper footwear. For those coming with families, they need to take care of kids and elderly. It is because the route involves rocks and slopes. That means a careless act may lead to injuries. Not to mention the path is a little bit slippery. Next, it is related to the foods. It is recommended to carry snacks and bottled water, as no nearby eateries are available. Once tourists reach Sorong City, they may continue their trip Batanta Island. That means they may take advantage of a speedboat to reach the location. A long boat is also available for those who come in a group. The voyage takes about 30 minutes. Once they reach Batanta Port, it is time to reach Arefi Village. From the location, they need to conduct small trekking to reach the waterfall. That’s all.